How do YOU research your vacations? The sun rises in the Grand Canyon. If you’ve been looking for Grand Canyon Whitewater on TripAdvisor, you’re not going crazy — we were removed from the TripAdvisor platform. The explanation we received from TripAdvisor is that the platform is created strictly for businesses who offer a one-day or shorter trip option. Businesses who offer multi-day trips only are technically not allowed to be on TripAdvisor and unfortunately we were noticed and removed. 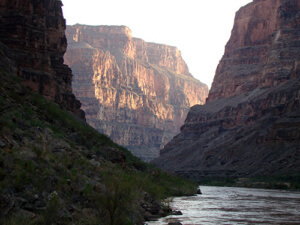 Grand Canyon Whitewater does not offer one-day trips. In fact, our shortest trip offering is 4 days and our longest is 15 days! However, we believe it is INCREDIBLY important for potential guests to have the ability to read reviews of our company via a non-biased, third-party platform. So, our struggle is to find that place — the place where potential guests can review our company, read past reviews and compare, if they wish, to other outfitters (although we’re all great!). TripAdvisor was a great outlet, but it is no longer an option available to us. So, our question is to you, our guests and potential guests. Which OTHER platforms do you use to research a vacation? We would love to hear from you.